A JUDGE HAS warned that anyone found recording the court proceedings of water charge protesters accused of falsely imprisoning former Tánaiste Joan Burton could be found in contempt of court. Anti-Austerity Alliance TD Paul Murphy and 18 other people face charges of false imprisonment of the TD and other offences following a water charges protest in Jobstown two years ago. 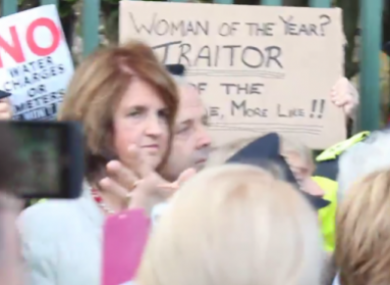 Burton and her entourage had left a graduation event at An Cosán Education Centre at Jobstown, Tallaght when a demonstration was held which delayed her for about two hours on 15 November, 2014. She and her team had been attempting to travel by car to St Thomas’ Church for the rest of the ceremony when it is alleged violence broke out. Judge Melanie Greally was speaking at the latest hearing at Dublin Circuit Criminal Court to set trial dates for the 19 defendants. Amongst the defendants Dublin Councillor Kieran Mahon (38) of Bolbrook Grove, Tallaght, Anti-Austerity Alliance Councillor Michael Murphy (50) of Whitechurch Way, Ballyboden and Paul Murphy of Kingswood Heights, Tallaght, Dublin. At the hearing today, the court heard that the Director of Public Prosecutions proposed to deal with these accused via three trials. There are also related proceedings before the Children’s Court. Lawyers for some of the accused told Judge Greally that their clients would be disadvantaged by being in the third trial as the witnesses for the State will have been cross-examined three times by that stage. David Staunton BL, defending, said that this repetition would remove the element of surprise from cross-examination the fourth time round. “Prosecution witnesses will be very polished at this stage,” added Mr Peadar Ó Maolain BL. Before the submissions began, Judge Greally told the packed courtroom that at the last hearing in May “persons were observed recording these proceedings” on mobile “smart phones”. She said that anybody seen doing this would, at the least, be removed from the courtroom and would be in danger of being found in contempt of court. After hearing submissions from lawyers for all 19 accused Tony McGillicuddy BL, prosecuting, told the court that there wasn’t a way of keeping everyone happy with regard to organising and scheduling the various trials. “Somebody will have to go first, somebody will have to go last,” he said. Judge Greally adjourned the matter to next October when she said she will set date for all trials. The judge previously ruled that the accused should have separate trials, saying that to trial all the accused together would place unrealistic demands on jurors. A number of defendants, including Paul Murphy, were not present for the hearing after the court had previously excused their attendance due to work commitments. Email “Judge warns people against recording Jobstown trial on their smartphones”. Feedback on “Judge warns people against recording Jobstown trial on their smartphones”.